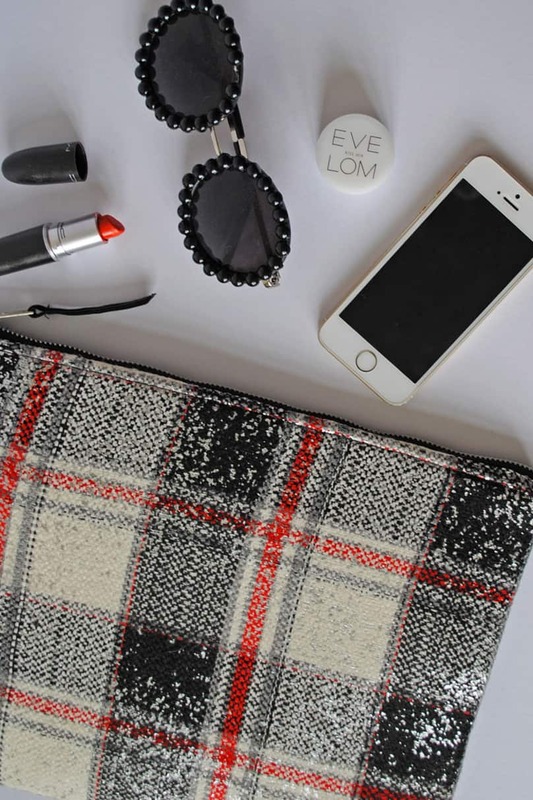 Beautiful, plaid oversized clutch bag in thick woven check fabric. Structured inner, top zip fastening with chunky silver zip and black leatherette puller. Made with fabric remnants and recycled zips. Zero waste, up cycled piece from the ‘Salvage’ range. Fully lined, will easily fit phone, purse, make up in this bag. A great Summer alternative to a handbag too. The plaid is real wool, black and pillar box red over a cream / off white background, with a metallic silver spray print overlay. Worn here with Black Bardot Dress. Wipe clutch bag with damp cloth.